Ahti Lavonen (1928-70) came from a working-class background and studied art at the Workers´ Educational Institute and the Free Art School in Helsinki in 1946-48. He first exhibited in the Young Artists Exhibition at the Kunsthalle in Helsinki in 1949 and again in 1952, followed by numerous joint exhibitions throughout his career. Lavonen´s first solo exhibition took place in 1956 and, beginning in 1961, he had multiple solo exhibitions annually until his passing in 1970. In 1962-65, he worked in Paris. Initially, Lavonen´s background and limited studies made exhibiting and selling his works difficult but his success at the Venice Biennale in 1962 and in competitions organized by the Finnish State finally contributed to his breakthrough to the forefront of Finnish modern art. At the same time, interest in abstract modernism increased in Finland. After primarily painting landscapes and still-lifes, often with a brownish tint, in the 1950s, Lavonen moved towards informalism in the early 1960s, becoming one of Finland´s leading modernist painters. 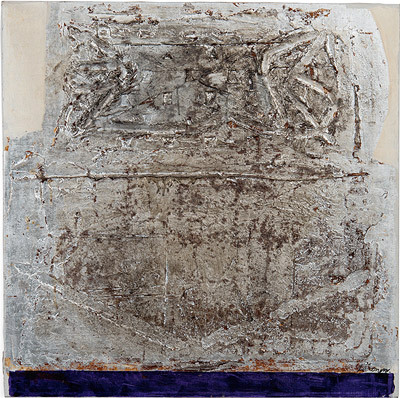 However, Lavonen is particularly well known for his work in the mid´ to late 1960s featuring white or color surfaces often prominently incorporating silver.